Convert an exported calendar into a table. Is there a better alternative to ICSviewer? Is ICSviewer really the best app in Productivity category? Will ICSviewer work good on macOS 10.13.4? ICSviewer is a tool to convert an exported calender (.ics file) into a table-formatted data grid, while calculating the hours you worked. You can choose to show which columns you like to see and export, from the most useful set of properties. 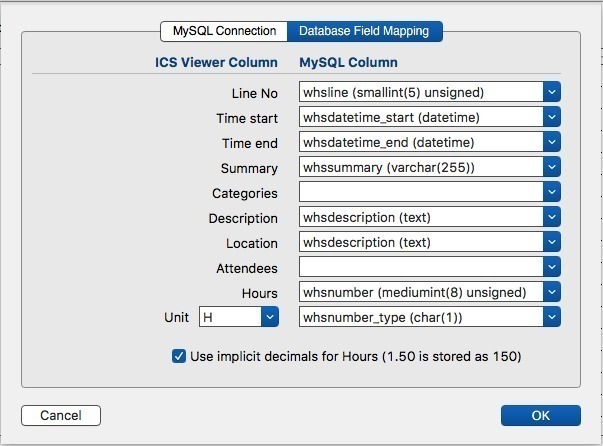 ICSviewer can export the calendar data into a CSV file, directly into a MySQL table or via copy/paste right into an Apple Numbers or Microsoft Excel spreadsheet. A hang with the new initial date-range preference setting 'Current month' has been fixed. The possibility to use the new initial date-range preference setting has been fixed. Various UI improvements in the preferences window. ICSviewer needs a review. Be the first to review this app and get the discussion started! ICSviewer needs a rating. Be the first to rate this app and get the discussion started!